Beverly comes home from a dinner - she's brought an old friend called Ewan home with her. Jim has already met Ewan at the garage - where he boasted about wooing an old friend. Ewan has just left, one hour later. Jim isn't pleased that Ewan is Beverly's old boyfriend and explains about Ewan and his mate at the workshop. Beverly says Ewan must have been joking. Jim says he doesn't want Beverly working with Ewan. Beverly is not pleased and refuses to give up her research project because of Jim's jealousy. Sharon is in a tizz trying to get ready to go to New Zealand for the wedding. 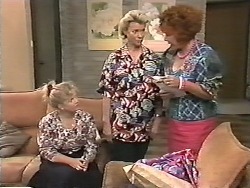 Gloria offers to help Sharon up by picking up her dress from the dry-cleaners. Matt brings round the rest of Lee's clothes that Kerry had lent her. Kerry sympathises with Matt. Matt is sad that he doesn't have any closure - Lee never gave him a chance to talk to her. Kerry suddenly realises that Matt's birthday is coming up and he admits it's actually today. He's actually 18 today, but he doesn't want a fuss. He tells Kerry not to tell anyone. Jim and Helen are having lunch. Jim is deep in thought. 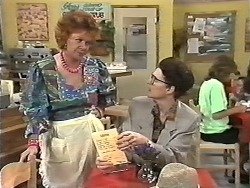 He asks Helen if Beverly has even mentioned Ewan to her. Helen tells Jim that he ought to trust Beverly, and he insists he isn't worried - but things can happen when people work together. He says Ewan is a very smooth operator, and their own relationship has been very rough lately. 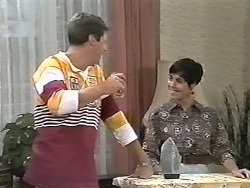 Helen warns Jim to behave himself or he'll regret it. Gloria sympathises with Dorothy about her food poisoning. Suddenly Gloria realises that she hasn't picked Sharon's dress up and it's after half past five. She rushes out to the shop. 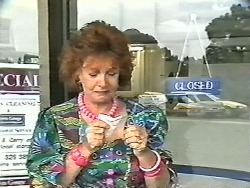 Gloria bangs on the door but the shop is shut. Kerry is ironing when Joe comes in, drinking a glass of his home-brewed beer. They talk about Matt - and Kerry tells Joe that Matt is 18 today and he's got no party, cake or anything. Joe is shocked and suggests they get Matt over tonight and cheer him up over some home-brew. Matt and Joe are having a beer. Kerry has made him a birthday cake with eighteen candles. Matt is quite pleased and blows out the candles in one go. Matt still looks depressed and Joe tries to cheer him up - there's plenty more fish in the sea. Matt says he has no idea what he did wrong in his and Lee's relationship, but Kerry says it was probably just that the timing wasn't right. Matt looks a bit happier. Helen and Gloria are making the dress out of some purple material. Helen and Gloria are sprawled in chairs, exhausted. Sharon tries on the dress and, thank goodness, it fits well. She's very pleased - she likes it even better than the dress at the dry-cleaners. Helen and Gloria suggests taking up the sleeves slightly to perfect the dress. Matt has brought some roses around for Kerry to thank her for helping him celebrate his birthday last night. He says he's decided to perk up a bit from now on. Talking it out with Kerry and Joe has really helped him. Beverly is pouting (just for a change). Jim has relented about Ewan and says he wants a truce. Beverly says that Jim never made a fuss when she worked back late at the surgery with Neil. JIM: NEIL WASN'T TRYING TO STEAL MY WIFE!! BEVERLY: See, you are jealous. Jim calms down a bit and says that Ewan just got under his skin at the Workshop yesterday. But he says he can handle it - he knows how much the reserach project means to Beverly. The moving men are unloading some weird statues why Helen, Kerry and Joe are speculating who the new owner is, based on the furniture. 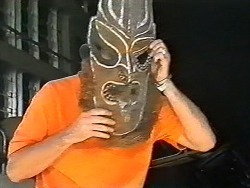 Joe goes into the van and looks at an African mask. Just then, Dorothy Burke turns up - she's the new owner of Number 30! DOROTHY: I'm your new neighbour. JOE: Oh, give me strength! 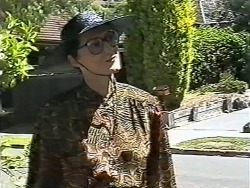 HELEN: Welcome to Ramsay Street! Dorothy tells Joe that she wants his fence moved - according to the survey she's had done, he's occupying a metre of her land. DOROTHY: Negotiations can be friendly or not. But I intend to have what's mine.